Have a club or school colour logo which you want on all your awards this year? 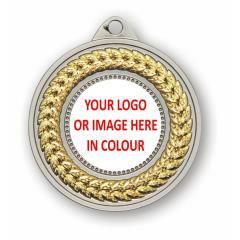 Then, consider these great personalised medals which let you place your logo on the left of the medal on a 25mm disc. Be truly patriotic with this medal which also features the Aussie southern cross. Available in antique gold (shown), silver or bronze with the ribbon colour of your choice.